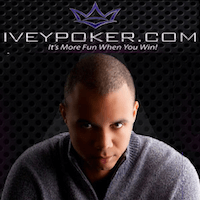 If you were to ask most poker players, the name Phil Ivey by itself carries enough weight to make any website carrying its name credible, but for the eponymously named IveyPoker.com, the name Phil Ivey is just the centerpiece for what is becoming a very vaunted lineup of poker pros. The Ivey Poker stable of sponsored pros is now up to 13, after the site added seven names last night. Soon after the site launched in a beta-mode the roster started to grow. The first players added to the Ivey Poker roster were by far the biggest, with 2012 World Series of Poker Main Event Champion Greg Merson, perhaps the greatest female poker player of all-time Jennifer Harman, and one of the very best high-stakes cash game players of the last decade in Patrik Antonius. As the weeks went by IveyPoekr.com added some of the brightest young players in the game in Cole “CTS” South and James “Flushy” Dempsey, both of whom began their poker careers as online players before repeating their success in the live tournament and cash-game arena. Now the site has added a further seven players to the roster, more than doubling the size of the IveyPoker.com stable overnight! While the names aren’t quite as eye-popping of the previous announcements, they do represent a very good mix of players from around the globe, who excel in cash-games and tournaments, both live and online. With nearly $1.5 million in career tournament earnings Brikis is the consummate tournament grinder, playing events across the country from 300 buy-in side events to $5k Main Events. His biggest score came in 2009 when he finished in 2nd place in the $5k Six-May NLHE event at the WSOP, pocketing over $600k. Tamayo is another tournament grinder who saw his biggest score come at the 2009 WSOP, where he finished in 21st place in the Main Event. With career tournament earnings approaching $1 million Tamayo could be the best tournament player you have never heard of. The Canadian is the second female player signed to the Ivey Poker roster. Gillian may not be a household name, but as a high-stakes cash-game pro she has earned the respect of the poker world. The 2011 November Niner is one of the best cash-game players in Las Vegas, and as we saw at the WSOP final table he is no slouch when it comes to tournaments either. Giannetti has $4 million in career tournament earnings, including a WPT Championship and his 4th place finish in the 2011 WSOP Main Event. Eames is a tournament poker pro from the UK who has been tearing up the European circuit for several years. Still in search of that first big breakout win, Eames is a great signing for Ivey Poker. Peters is yet another tournament pro signed to the Ivey Poker roster that has been very successful, but simply hasn’t managed that one big win. The latest batch of signings would seem to point to the site now signing excellent players who are due for a big win. The least known of the signings, Botond is a Hungarian poker pro who has final table appearances at the WSOP, the EPT, and the WPT.